Lisbon is a great tourist destination, with plenty of sights to be discovered and admired for the duration of one’s stay in the capital of Portugal. In order to do just that, tourists must first consider the means available for getting to Lisbon and opt for the most convenient of all, depending on their holiday priorities. Thus, traveling by air is the most straightforward manner of getting to Lisbon. Alternatives refer to traveling by train, by bus or, simply, by car. Lisbon is serviced by the largest and most crowded airport in the whole of Portugal. The venue is located some 6.5 kilometers from the center of the city, in close vicinity to Loures (city and municipality in west central Lisbon), and it accommodates the main headquarters of companies like TAP Portugal and Star Alliance. There is a plethora of airline companies operating at Lisbon Portela Airport, providing both business class and low cost flights to tourists around the world. Thus, the airport is the operation site of about 40 airline companies, of which the most notable are Turkish Airlines, Lufthansa, Finnair, Easy Jet, Air France, Blue Air, British Airways and Brussels Airlines. These companies ensure the connection between Lisbon (and, by extension, Portugal) and virtually all corners of the world, linking the capital to destinations like Amsterdam and Paris, Madrid and Rome, London and Moscow, the Canary Islands, Bucharest, Philadelphia, Tunis, Tel Aviv, Cairo and so on. Given the short distance between Lisbon and the airport, as well as the reliable airport transfer means (chiefly, by bus and by taxi), it is obvious Lisbon Portela Airport is the solution at hand for people who want to get in no time to the capital of Portugal, in case the time-saving aspect of traveling is essential for tourists who don’t want to waste time on issues like getting to the destination of their choice. 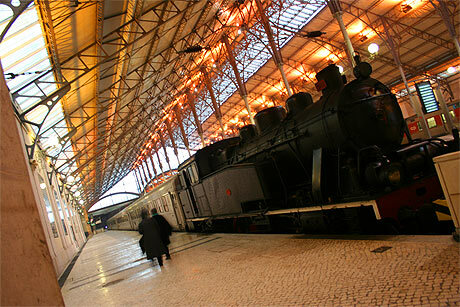 For complete information on the trains arriving at or departing from each of the four stations of Lisbon, schedules, connections, ticket prices and the like, please visit Comboios de Portugal. The company can also be contacted at 808 208208 or by dialing 00351 707201280 (from abroad). In terms of bus connections, Lisbon is fairly well linked to virtually the entire Portugal by means of the bus lines made available by the so-called Rede Nacional de Expressos. Thus, for instance, there are 9 buses a day covering the distance between Lisbon and Porto, 6 buses which ensure the connection between the capital and Lagos, and 14 buses transporting tourists between Lisbon and the north central Coimbra. The main bus station in Lisbon, at least as far as domestic bus trips are concerned, is Rodoviaria da Sete Rios (Sete Rios Bus Station). For international bus connections between Lisbon and other European destinations, Eurolines seems to provide the most extensive offers. The company has two main headquarters in Portugal, one in Lisbon and the other one in Porto. Some might find it rewarding to get to Lisbon by car. This is, without a doubt, one of the most time-consuming manners of traveling to the capital of Portugal, first of all due to the city’s geographical location on the west coast of the country, and secondly because the first step of getting to Portugal is to cross Spain. The border between the two countries is pegged out by 15 checkpoints, so the alternatives are fairly reasonable, as far as their diversity is concerned. The border crossing process is also said to be, as a rule, quite smooth. Depending on the direction from which tourists head for Lisbon, they can resort to several motorways and national and European roads. People who come from the south can take the A 2 Motorway, whereas the A 6 Motorway is recommendable for tourists coming from the east. Drivers who turn to these alternatives must be aware that they must also cross the 25 Abril Bridge in order to eventually reach Lisbon. Traffic can get quite sluggish on this bridge, especially weekdays. The A 12 Motorway is the best solution for tourists who come from the north. 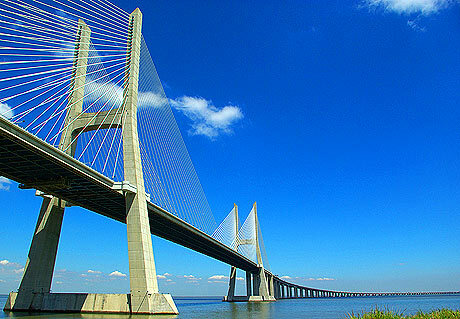 They must also cross the Vasco da Gama Bridge (the longest bridge in Europe). The A 5 Motorway is advisable for visitors who travel from the west. However, sundry other combinations are, indeed, possible. Most of the motorways which connect Lisbon with the rest of the country are linked to at least one of the three ring roads of the capital. In order to get familiar with the network of motorways, national and European roads of Portugal and make the most convenient decision in respect to what combination is the most suitable to each traveler’s holiday priorities, please visit Estradas de Portugal.